Jon: This was the first picture I took the moment I arrived on set. Three cameras around my neck, one loaded with colour daylight film, and a flash, another with tungsten film and the third with black and white. Used to get myself in quite a tangle! One of the wonderful things about writing a blog is the interesting people you're brought into contact with. It's been great being able to host the English language versions of Omar Ozenir's brilliant darkroom printing articles, one of which is the most visited post on this entire blog. 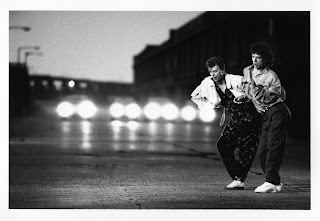 Now, it's a pleasure to be able to write a little about Jon Hoffman, a man who has made the journey from photographing rock stars and royalty to becoming an Anglican vicar. How many of us have that on our CVs? Jon's left comments on a few posts here and some regular readers will have already visited his new blog Some Old Negs where he posts and writes about shots from his archives. Before doing God's work, Jon used to work for the late, great Terry Fincher. Terry was a war photographer during the 1950s and 1960s, doing five tours of Vietnam. He was British Press Photographer of the Year for 1957, 1959, 1964 and 1967, a record. Jon used to print his negatives but emerged as a great photographer in his own right. produced in my darkroom. Love the grain! During an 18-year career as a freelance, Jon's photographs appeared on the covers of Newsweek and Time and in Life magazine. 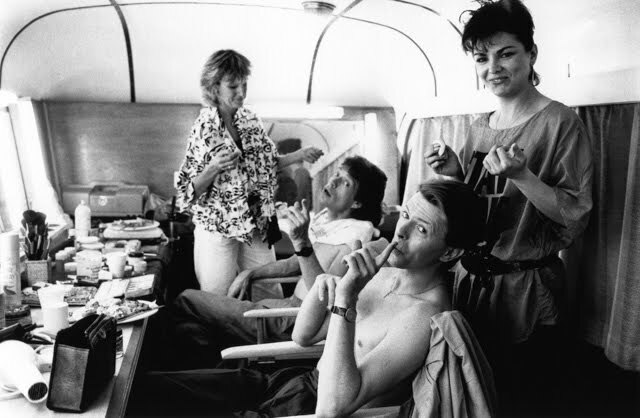 His blog opened with some black and white shots of Mick Jagger and David Bowie taken when they were filming the video of Dancing in the Street. Jon said, "I'm an Anglican vicar near Bath who used to take photographs for a living. Two separate lives that I want to bring together. The photographer priest! "My blog is an opportunity for some of my old negs to see the light of day. It's quite emotional looking back as I have been out of it for so long, but somehow film and the darkroom still hold a special place for me." If you love looking at great black and white documentary photography then bookmark Jon's blog - a window not just on an earlier time but on a different life for the Photographer Priest. Bruce, how lovely seeing this on your blog. It felt like the old days, waking up to see my work published. You are very clever putting all the words together. I had better start doing some new posts! It's a pleasure, Jon. No turning back with your blog now!